TEHRAN — A prominent U.S.-born journalist working for an Iranian state-run satellite television channel has been arrested in the United States, the broadcaster said Wednesday. 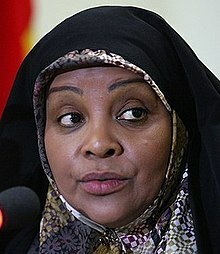 U.S. officials have not confirmed the arrest of the journalist, Marzieh Hashemi, who has lived in Iran since 2009 and is an anchor at Press TV. Press TV said Hashemi, 59, was arrested at the St. Louis airport Sunday and was then transferred by the FBI to Washington, where she remains in custody. No charges have been filed against her, the channel said. The report of Hashemi’s detention comes a week after Iran confirmed it had detained a U.S. Navy veteran, Michael White. White’s family said he was arrested in July while visiting his Iranian girlfriend, and he has been in custody on unknown charges since then. A relatively brief news story about the incarceration of Marzieh Hashemi (a born-here citizen of the United States) appeared in the January 16, 2019, edition of The San Francisco Chronicle. If a paywall doesn't intercede, and I can't promise it won't, you can read the full article by clicking right here. Here is a link to a follow-up story that describes Hashemi's treatment during a ten-day detention (now ended) which was terminated without any charges being filed. I think I am noticing a trend. Nations, in engaging in conflicts with other nations, are now starting to take individual people as "hostages," to use them as bartering chips in those international conflicts. China has been doing it, and it appears that the United States is right with them. Iran takes someone hostage, so our country does the same. If someone is alleged to have committed a crime, it is appropriate to arrest and try that person, but it is not appropriate to detain anyone without bringing them immediately before a magistrate, in public, and making clear what the government claims that the person has done wrong. That didn't happen here, presumably because the government was relying on provisions in the Authorization for the Use of Military Force (AUMF) that allows the United States government to incarcerate "terrorists" without ever proving any such charge. If "we the people" are in charge (and I'd like to think we still are), we need to say: "no more hostage-taking." If you'd ever like to contact your Member of Congress, on any topic, you can click right here for some assistance on how to do that.